The award-winning Honda Accord Hybrid (http://automobiles.honda.com/accord-hybrid/), boasting the highest EPA city fuel economy rating of any four-door sedan sold in America1, was named to Kelley Blue Book's KBB.com annual list of the 10 Best Green Cars for 2015, its second straight appearance on the KBB.com green car list. 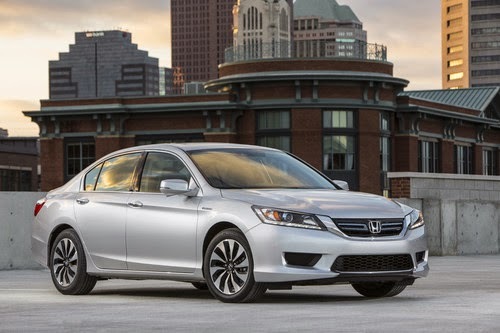 The industry experts at Kelley Blue Book praised the Accord Hybrid's stellar fuel economy ratings and excellent value proposition. "Eco-minded drivers looking for a new 'green' vehicle with low CO2 emissions don't have to look further than the fun-to-drive and fuel-efficient Accord Hybrid," said Steven Center, vice president of the Environmental Business Development Office at American Honda Motor Co., Inc. "Recognition from the trusted editors at Kelley Blue Book is proof positive of the progress Honda has made developing increasingly cleaner vehicles over the last 40 years." The 2015 Honda Accord Hybrid is designed for outstanding fuel efficiency and fun-to-drive performance and boasts EPA fuel economy ratings of 50/45/47 mpg (city/highway/combined). The Accord Hybrid's two-motor hybrid system, part of an expanding lineup of Honda EarthDreams® Technology powertrains, seamlessly blends electric-only, hybrid and engine drive modes along with powerful regenerative braking to provide highly responsive, refined and fuel-efficient performance in a wide range of driving situations. "The Honda Accord is one of the best values in the American auto market, and we expressed our admiration for the model by naming it our Kelley Blue Book Best Buy in the hotly contested midsize car category," said Jack Nerad, executive market analyst and executive editorial director for Kelley Blue Book's KBB.com. "So when you take all that goodness -- fun-to-drive, great ergonomics and stellar reliability -- and add a sophisticated powertrain that has a 50 mpg fuel economy rating, you have a very compelling proposition." KBB.com's honor adds to the growing list of prestigious awards for the Honda Accord Hybrid that include being named About.com's "Best New Cars of 2015" and Green Car Journal's Green Car of the Year. The Accord Hybrid also earned a TOP SAFETY PICK rating by the Insurance Institute for Highway Safety (IIHS) and a 5-star Overall Vehicle Score by the National Highway Traffic Safety Administration (NHTSA)2. For more information about KBB.com's 10 Best Green Cars of 2015, please visit http://www.kbb.com/car-reviews-and-news/top-10/best-green-cars-2015/. Based on its vision of "Blue Skies for our Children," Honda is taking a comprehensive approach to reducing the environmental impact of its products, advancing fuel efficiency, low emissions and fun-to-drive performance with new powertrain technologies from its EarthDreams® Technology lineup, which includes more fuel-efficient engines and transmissions and advanced electromotive technologies. Honda will offer several next-generation, advanced powertrain vehicles, including an all-new fuel cell vehicle in 2016, and all-new battery-electric and plug-in hybrid models by 2018. Honda will also expand the use of its advanced two-motor hybrid systes in the years to come. Together, these vehicles will offer significant sales volume, enabling Honda to bring ultra-low carbon transportation to consumers in the U.S.
2 Government 5-Star Safety Ratings are part of NHTSA's New Car Assessment Program (www.SaferCar.gov). Model tested with standard side airbags (SABs).